Wanna make those boring string pasta dishes look more interesting? 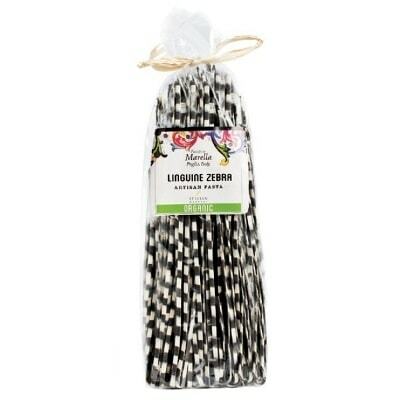 Here’s the perfect organic pasta from the brilliant artisans of Marella, Linguine Zebra Black & White. Looking more like chocolate wafer sticks, you cook it in boiling salted water, just like you would any string pasta. Then, serve it with your favorite pasta sauce. Ecco! You’ll have a pretty pasta dish reminiscent of a Tim Burton movie. Your guests will definitely be talking about it for days to come. So make your plain jane pasta dish the pièce de résistance of your dinner parties. Grab a pack today!